Little Valley farm is an off-grid farm with a 1950's Sydney Train carriage - the famous Red Rattler train. 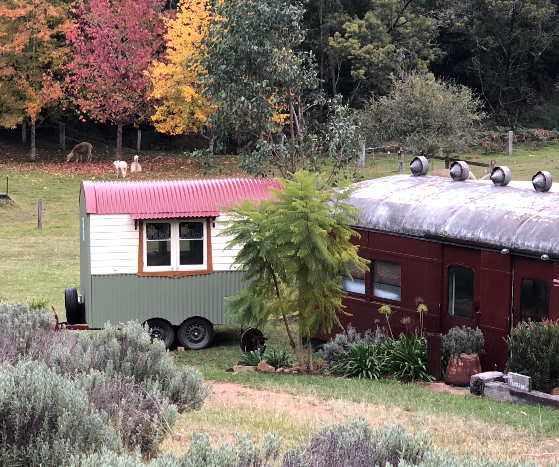 Rustic farm stay 'glamping' style at Little Valley Farm: Satisfying your craving for the outdoors and your penchant for a good meal, nice glass of wine, and a comfortable bed. Its nothing like a hotel, your room does open up to a beautiful landscape instead of a lobby. A unique 'glamping' farm stay experience for adults plus its the perfect place for star gazing and so much more. We live in a small beautiful secluded valley surrounded by bushland. Our paddocks are the local Wollaroo favourites with good grass all year round. We grow seasonal produce, especially in autumn, spring and summer. Our train deck is the perfect place to hang out and watch our huacaya alpacas, guinea fowl and chickens moving about the farm totally surrounded by bushland and creek frontage. We are a working alpaca farm so you will see us about and about. You can get involved in as little or as much as you like. Our house is located up the hill behind the train. Outdoor wood-fired pizza oven (Requires booking in advance: needs 3 hours slow burn - BYO Pizza). Total Fire ban restrictions may apply during some seasons. The 'hang-out' deck overlooking the alpaca paddocks. Plus we have two comfy hammocks and a couple of yoga matts available. We are an off grid farm and the train is only 12 volt so you can charge your mobile or torch but its not suitable for hairdryers or coffee machines. The train is not insulated but there is a gas heater in the lounge area and lots of heavy donnas in the bedroom for winter - true glamping style! Winter will be cold and summer can be hot - so be prepared for the ‘clamping’ elements. Bookings: Spring, Summer & Autumn 2+ nights bookings we take. Winter we take 1 night bookings and our booking calendar will stipulate this. GNTP - Great Northern Trading Post has an amazing weekend dinner menu plus brekkie, lunch and great coffee and is only 4.5km. Book for dinner on a Friday night. Laguna Village Providore will have fresh fruit, veg, deli and providore goods available. Check their website for opening hours. Mount Yengo and Finchley Track for bushing walk and sight seeing is a short drive away. Find more info here. If you would like to hire bikes to get around please contact Wollombike hire for more info here. If you would like a wine tour, please contact Grape Experience Tours fore more info here. For things-to-do, eat and explore please visit the visitwollombi website for more info. If you are attending a Pokolbin concert or hot air ballooning - its approx 40 mins drive. Road access is by standard 2WD & 4WD but you will need detailed directions. Our road is not suitable for motorbikes. Our road is a dirt track road with potholes and surrounded by thick bush. It is steep but only in a small section. It looks rough but any standard 2WD car can get up it. Low cars will need to go super-slow. The wedding pick up bus will have to pick you up and drop you off near our letterbox. You will then need to drive to the train. Our driveway is not suitable for buses. We have limited wi-fi (unreliable) and there is no mobile reception in Laguna, which is a great excuse to unwind from it all. If you pop up to the house we can sort out the wi-fi and we have a fixed landline phone that you can use. We are here for your arrival and departure and to show you around. I will give you a quick tour of the kitchenette and also how the waterless-composting toilet works, 12V lighting plus a couple of other lovely features. The Train has limited 12volt lighting/240volt access is possible on a sunny day. The entire farm is solar run. Rainwater is harvested for the house, livestock & the produce we grow. Please shut all gates to protect our livestock. Drive slow down our 1k driveway as there are wombats, roo's, lyrebirds, goanna's and a lot of native birds and pot holes! Look out for our neighbours kids on their horses and ponies. We are a working farm so you will see us about attending to our daily chores. Pack an esky so you can enjoy brekkie, lunch or dinner on the train. The wood fired pizza oven takes 3 hours slow burn to set up so book it in advance. The train is not insulated nor the bedroom so its cold in winter. Make sure your car is suitable for our driveway. Good for standard car and 4WD. Please ensure you take the time to read our T&C's or feel free to send us a query. ID will be requested on booking and confirmation time. Find us on face book and instagram to see what we are working. This is a couples farm stay and we don't accept children under the age of 12. Check out 12noon (if you would like an earlier check-in you will need to book two nights). Little Valley Farm has been featured on the ABC Newcastle and Hunter Coastal Lifestyle magazine and best of all, it's a unique glamping experience in the Wollombi Valley. Find out more about Little Valley Farm on our facebook and instagram accounts.